Fun & Inspiration 6 Simple Rules For A Long Lasting Relationship! 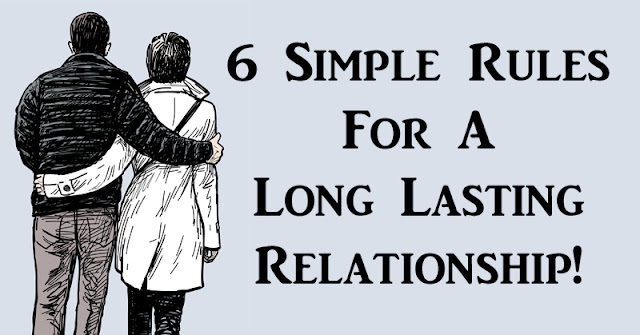 6 Simple Rules For A Long Lasting Relationship! The beginning of a new relationship is great, isn’t it? You get butterflies when your partner is near. You miss them the second they leave, and you can’t wait to talk to them or spend time with them. But as time goes on, those butterflies may begin to fade. This is when it becomes more difficult to make the relationship last. If long relationships aren’t exactly your forte, here are six simple ways to make your relationship last. Communication is an essential component in a relationship. Without adequate communication, signals get crossed and miscommunication happens, which can lead to a fight. Open and honest communication is also important in order to maintain a closeness in your relationship. The more you and your partner are willing to share about your hopes, dreams, goals and feelings, the closer you’ll feel. If you notice you’ve gone a few days without having a real conversation with your partner, make a point to sit down and talk. Put your phones away and enjoy a private dinner, a walk in the part or a coffee date while you catch each other up. Intimacy is more than just a physical thing. In order for a relationship to last long-term, it’s important to keep romance and intimacy alive. This includes your physical connection, as well as your emotional connection. Keeping the romance alive isn’t usually a problem at the beginning of a relationship, but it tends to drift off in many cases. Make intimacy a priority in your relationship. It’s all to easy to fall into a negative state of mind when things aren’t going your way. You might be having a bad day, a bad week or a bad month, and it’s all you can talk about. While we all need to vent every once in a while, try to focus on the positive things in your life when you’re with your partner. A negative mindset can end up bringing you both down and affecting your relationship. In the same sense, if your partner is stressed out about the overtime they’ve been working, let them know how much it’s appreciated. If your partner has anxiety about upcoming bills, let them know you’d be happy to have a few “stay in” date nights instead. Even if you refer to your partner as your other half, chances are, you two aren’t always going to agree on everything. It’s important to know that it’s OK not to have the same viewpoint on every subject. Instead of turning a disagreement into a full blown fight, look for a way to compromise. If it’s a small decision, take turns. If you got to pick the movie, let your partner decide where to eat for dinner. We all make mistakes, but for some, those mistakes are hard to admit. In order to make your relationship last, sometimes it’s necessary to swallow your pride and admit when you’re wrong. An apology can go a long way. If it’s your partner who makes a mistake, be accepting of their apology. Forgive and move on. Holding a grudge against your partner will lead to resentment and eventually, the relationship will fail. While running from your problems might seem like the easiest route, it’s always the least rewarding. When things are rocky, make the decision to stay and fight for the person you love. Make a commitment to each other to stay strong, even through the difficult times. If you refuse to give up, you can make it through anything.